Boomarang style magical weapon from the movie, Krull. This prop is made of cast resin with acrylic jewels. Its a beautiful piece. 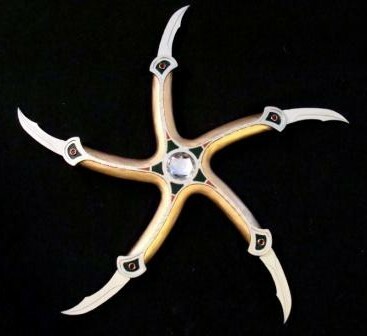 The blades are resin as well and will be able to be removed though they do not retract like in the film. Measures approximately 13 inches in diameter. Available in both finished or kit form. We HIGHLY recommend getting the display stand found below. Note: due to the popularity of this kit, you can expect a two week lead time. The finished version comes fully painted and assembled as pictured up top except for the blades which are kept removed for shipping. 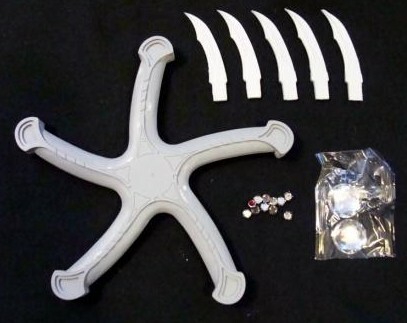 The kit comes with all parts shown (at left) as well as instructions. Glue and paints are not. It comes with the two resin halves already glued together though it is up to the customer to do all putty work, painting, and gluing of the jewels. Though not much assembly is needed, it is very time intensive to make it look good and a lot of hand painting is involved. The small red rubies could be easily lost and you may want a small pair of jewelry pliers to handle them. This kit is not recommended for the first time kit builder. 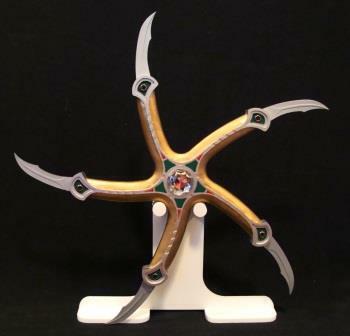 Need a way to display your Glaive? This easy to assemble stand kit works perfectly. If you rest the Glaive on its blade tips, the thin material can bend over time so its important to keep the weight off them. This stand will do just that.